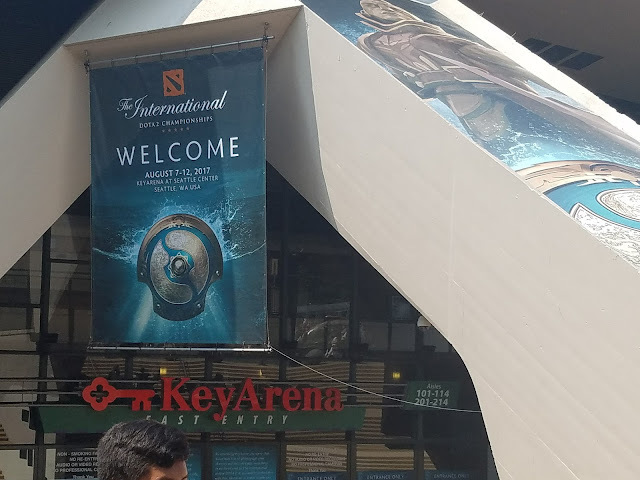 Just got back from Seattle where Breaky and I attended The International Dota 2 Championships. And by "just got back" I guess I mean I've been back for like, three days, but only now have the energy to actually write anything. While this wasn't my first video game tournament I have attended. I went to the Heroes of Newerth Grand Finals in Las Vegas, but let's be honest, I spent quite a lot of time by the pool during that time. 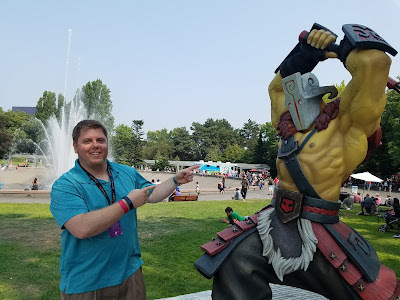 I also attended Blizzcon, but that whole convention was a little different. Full disclaimer, I have never actually played Dota 2 (or HoN or Heroes of the Storm or any other MOBA) but obviously the game and the scene is super important to Breaky, my husband. Therefore, it is a huge part of our family. 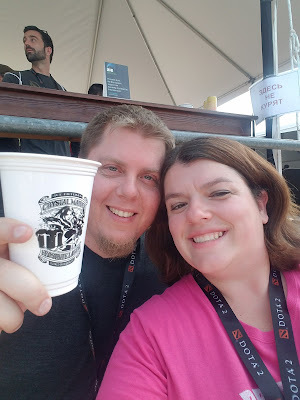 So when it came about that we would have the opportunity to go to The International (or TI) in Seattle in August, I decided it would be good for both of us to go. 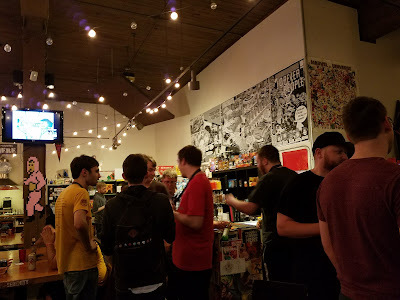 Because I work full-time, we decided I should just come to Seattle for the second half of the week, and Breaky would fly in Monday morning and I would fly in Wednesday and just take off 3 days of work. The set up around the Key Arena where the event was actually held was really nifty. There was the Beer Garden, which was open to the public, as long as you were over 21. They had a bunch of screens showing the games, and they had beer, water and cider for sale also. 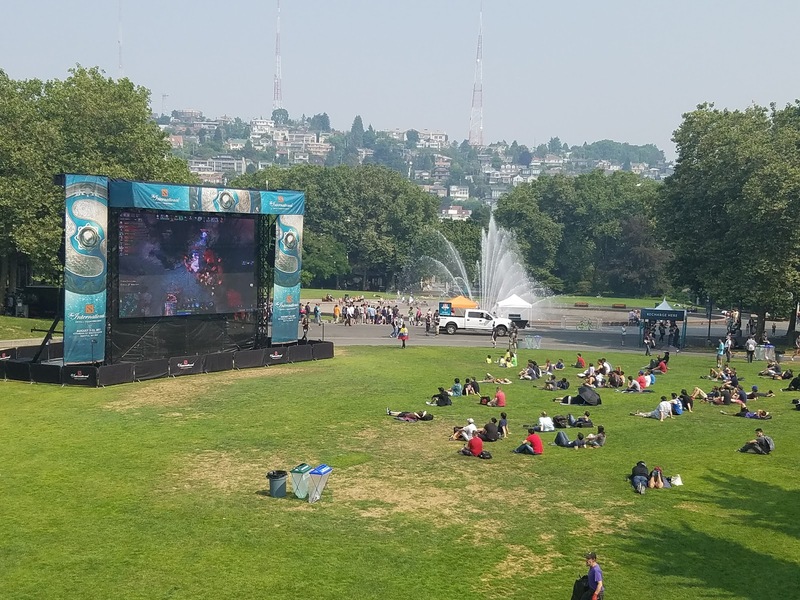 Within viewing distance of the Beer Garden was an huge screen and a huge field area for people to sit and watch. Note: we were extremely lucky with the weather. No rain and hardly and clouds that I knew of. Breaky and I split a lot of our time between going in the Key Arena to watch the matches (shout out to those who helped Breaky and I get passes, you know who you are!) to going outside to the Beer Garden and around the park in general. We met up with a lot of people whose names I recognized from what Breaky tells me about how his stuff is going. Speaking of which, huge shout out to the BTS, Pvgna, and DotP guys and gals! Lots of fun meeting you all. Proud spouse time: On top of meeting up with people he knew, Breaky would be approached about, on average, 6-8 times a day by a fan. 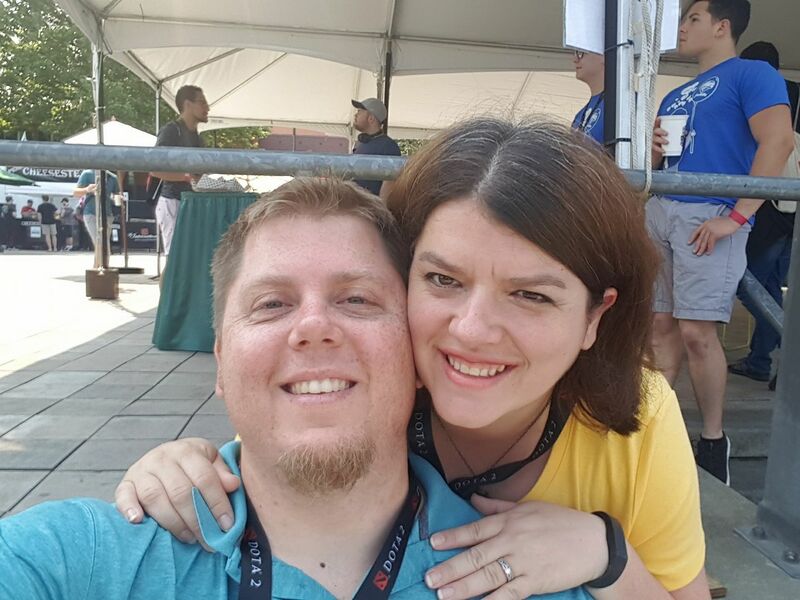 I played the ever-proud spouse with a huge grin on my face as many talked about how Breaky was the reason they got into the MOBA scene in the first place and how they have followed him since Honcast. Breaky was always so very gracious, always asking for their names, taking pictures (I helped with a few of those!) all the while being super humble as always. Breaky is the best teacher a wife could ask for. I knew very, very little about Dota 2. Let me put into words what I knew about Dota 2 before TI7. There were creeps. No context to what they were. For all I knew they were equivalent to trolls. When a caster like Breaky would get loud and shout fast and a bunch of colorful sh*t was happening on screen, a big fight was happening, although this rarely means the game is over. Because I am the household keeper of all things appointments and calendars, I knew that a game could last as long as 5 minutes (someone cancelled or postponed a game) to as long as an hour and 15 minutes, but on average was about 45 minutes. After learning more of the basics, I do have to say, I have mad respect for anyone who plays and enjoys Dota. It is a grind, but I can see now why people enjoy it so much. Without prompt, Breaky would explain things that went on with the game, from why a pick in the beginning of the game was good or bad or even different, to what creeps actually are, to the whole net worth thing and touched briefly on some items. If I tried to list everything Breaky taught me about Dota 2 during TI I would still be typing this into next month. Let's just say, I now understand the basics, but definitely couldn't pick up the game and play. 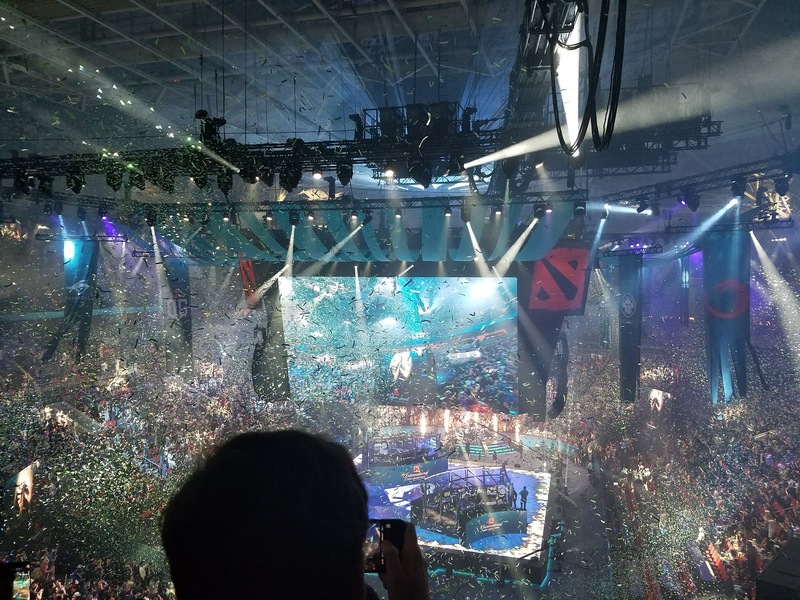 By the end of TI, I do have to say, I really enjoyed watching the games now that I knew more than just "loud noises and bright colors=fight". I was able to cheer along with everyone else because I recognized that things were happening. Super cool to be able to appreciate the game so much more. As a wife, I found this experience to be absolutely helpful in understanding what my husband does everyday for a living and the environment he deals with. I think this brought us together as a couple and I hope to continue to learn about the game and interact with the wonderful community (most of them at least) that I experienced this past week. What did I do when I got back from TI? 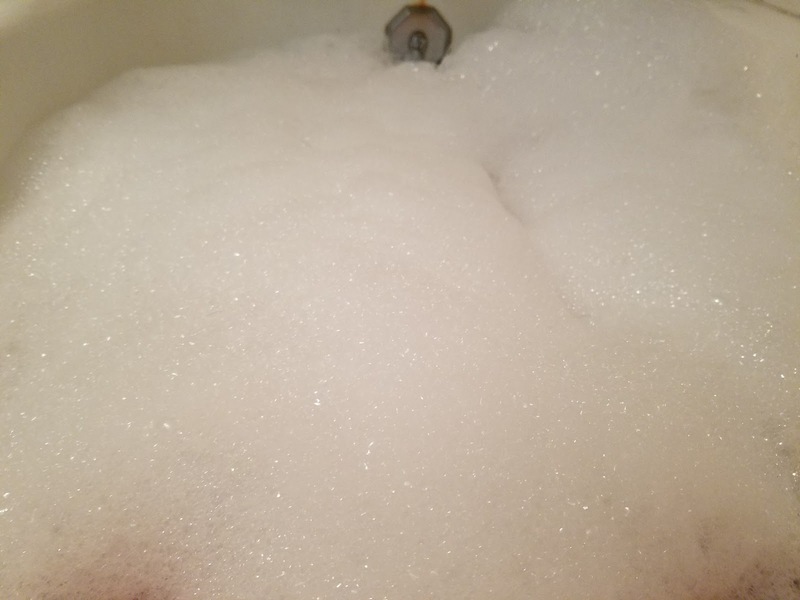 Bubble bath of course. We did a lot of walking and talking and all that, and I was sore and exhausted. This geek wife needed her R&R. Thanks again to everyone we hung out with, and thanks to those who helped hook us up with passes and swag and stuff! 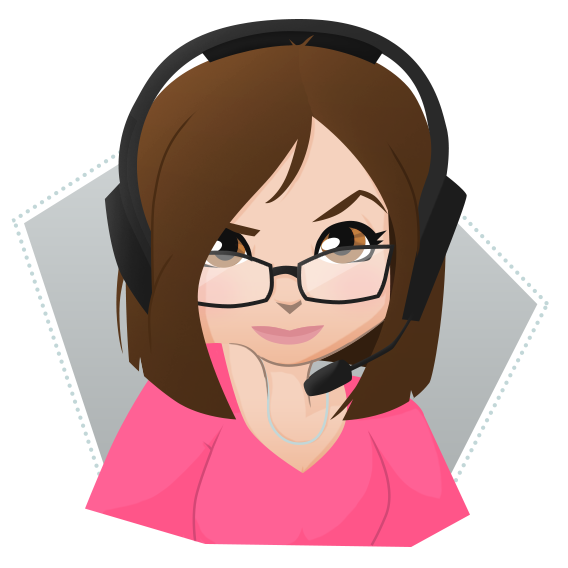 I look forward to attending more events, and tuning in and understanding more and more Dota matches!